Stewart Creek is a stunning gorge inaccessible by road or trail. 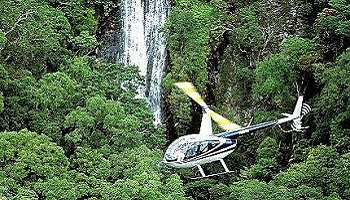 Depart from Silky Oaks helipad for a private champagne breakfast atop a rainforest waterfall. 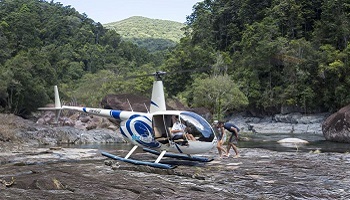 Fly over the Daintree Rainforest with stunning views out to the Coral Sea. 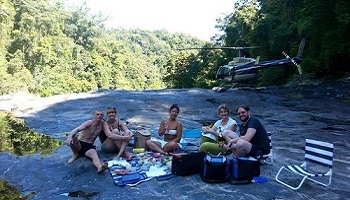 Upon arrival, your helicopter will land on top of the waterfall, and here you will enjoy a gourmet breakfast, along with champagne. Enjoy swimming in the freshwater pools, hiking in the rainforest, or just relaxing and taking in the stunning view before being flown back to Silky Oaks Lodge.